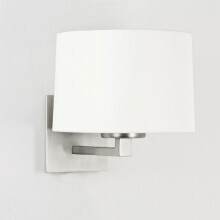 Subtle yet distinctive interior wall light with a matt nickel finish that will add an elegant freshness to your interior. Featuring an intriguing blend of classic yet contemporary styles the light features a matt nickel bracket housing both a standard lamp and a flexible LED. This gives you the freedom to choose different combinations of styles and strength of lighting to fit your mood. The style of this unique light would enhance almost any room, and is suitable for use in bathroom zone 3. It includes an integral LED driver, and complete with the drum white fabric.